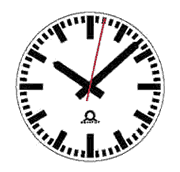 Flex analogue clocks have elegant metal cases and are available with an extensive range of dials, movements for many different synchronisation signals when used as secondary or slave clocks and with a variety of mounting alternatives. 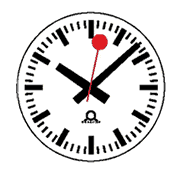 Flex clocks may be specified for synchronisation from impulse signals, GPS or radio time code, or self-setting IRIG-B, MOBALine, Rs485 or Ethernet-NTP data signals. Single and double sided clocks are available with special brackets for surface or flush wall mounting and ceiling suspension. Case options include ball throw protected cover glasses, stainless steel cases and steam resistant cases for difficult process and other environments. 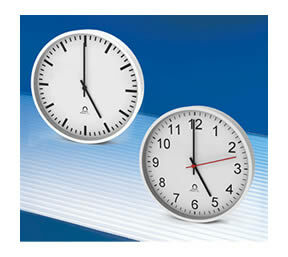 Flex clock cases may optionally be supplied finished to match any RAL colour standard.